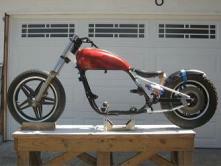 Want A Rolling Chopper Chassis? 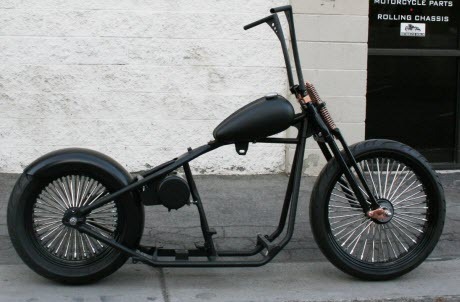 A rolling chopper chassis is a great alternative to building a bike from the ground up. Building the frame, and getting the right rake and alignment can be a massive headache, especially if you are building it in your backyard. And there has been quite an explosion in the rolling chopper chassis market. The reason is because everyone who watches those made for TV reality shows like the Bike Build-off or Senior Versus Junior (formerly American Chopper) wants to ride a chopper or bobber. However, having a motorcycle built by one of the big name builders will cost you some major money! They are famous for a reason, and their names carry a high price tag. For one thing, the resale value of a Jesse James custom is much higher simply because it IS a Jesse James build. Rolling Chopper Chassis or Kit Bikes? But you can have a chopper similar to the ones seen on the street or on these shows, but at much, much less expense. Many people build choppers from kits. Motorcycle kits vary in exactly what is included. Some are partially assembled, or fully assembled, and therefore are called "rolling chassis kits". Others are just the parts that you put together, called "kit bikes". You can buy all kinds of motorcycle kits. But the most popular kits are bobber kits and chopper kits. Same with rolling chassis. 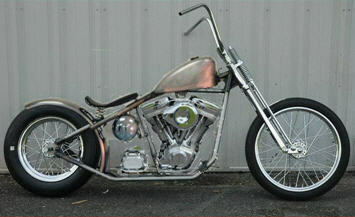 The most popular rolling chassis are bobbers and chopper styles. Bobbers are selling more. If you have basic mechanical skills, a good mechanic's tool kit, including some power tools, can measure exactly, follow directions exactly, and have a place to work (no, your kitchen won't do although many a bike has been built there), you can buy a kit bike and put it together yourself. These "bike in a box kits" usually come unpainted, and completely un-assembled. You will have to assemble correctly, check that everything balances properly, and have the bike painted yourself. 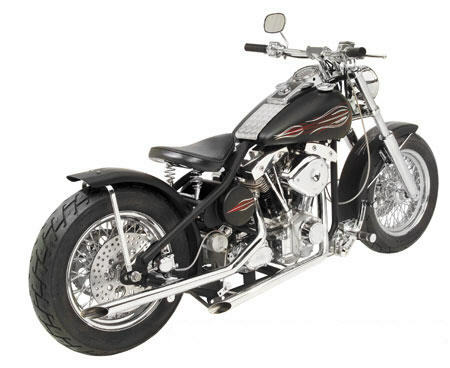 If you lack the requirements above, your best choice would be to purchase a bobber or rolling chopper chassis and you will know that basic chassis, wheels, front end, and such is all put together correctly. These kits can also arrive pre-painted, powder coated, or airbrushed to your specifications. What comes with these rolling chopper chassis kits? You receive a frame, either rigid or suspension (hard-tail or soft-tail), fenders, wheels, tires and associated hardware, handle bars, forks, triple-tree, oil tank (not always), fuel tank, pulley rotor, wheel caliper, wheel rotor, bolt-on 4 piston brake caliper and sometimes forward controls. What will have to be added to my rolling chassis kit? Everything else! You will have to add the engine, transmission, battery and case, filter system, wiring, head and tail lamps, turn signals, clutch, handle bar controls, switches, saddle, foot pegs, nuts and bolts, and everything else you want on your bike. All accessories will have to be added such as saddle bags, handle bar grips, any thing you want included, right down to custom battery case or air filter covers. Below you will see a bobber rolling chassis by the seller MikesPaintingPlace has a bobber rolling chassis kit which is partially completed. Note the cables and wiring, headlight, engine and battery, and battery case are not in place. There are other sellers on ebay, but this rolling chassis looks really nice. Anyway, this is the kind of product you would expect to see arrive when you order a rolling chassis kit (this one comes with the oil tank). How long does it take to build from a rolling chopper chassis? That depends mainly on you. If you are a good mechanic, have ordered all your parts so they arrive at the same time, and have everything ready to go when your "bike in a box" or rolling chopper chassis arrives, you could have a motorcycle up and running in a short time if you work every day, all day on it. Do not expect to have the bike finished over night. It just won't happen. Two to three weeks, working 8 hours a day, 5 days a week, would be a reasonable expectation, but that is for an experienced builder. The novice can expect to get advice from friends, run into glitches, probably misunderstand at least some directions, and take a bit more time to complete their build. Even pros run into glitches, and the novice can expect to run into many more than the pro. If you are in a rush to get a bike built and on the road, consider paying a local shop to assembly your rolling chopper chassis or bobber. They won't charge all that much to perform the job if you provide the parts all at once and you can be on the road rather quickly. Remember, after you build a motorcycle, you have to obtain a builder's title on the finished bike. Be sure to read "Everything You Need to Know about Car and Motorcycle Titles" for details on how to accomplish this rather complex task. If you save receipts and document properly, it doesn't have to be a difficult task and you can obtain a title rather quickly. You WILL in any case, have to obtain a road worthiness certification from a local law enforcement agency (differs by state) to ensure your motorcycle meets all road requirements to comply with laws in your state. Here's where to get more information on a bobber rolling chassis if that interests you most.